Running Ireland :: mysatnav.ie - Irish Dealer, Warranty, Support & Knowledge. 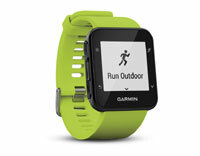 A selection of Garmin's most popular running watches. The aim here is to be as competitively priced as possible. 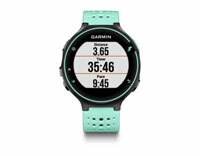 GPS watches are offered substantially discounted against normal Garmin prices. If you know what you want, you will find it here cheaper. All watches are brand new, come direct from Garmin with a full 1 year warranty. If you have any issues, we offer full local after sales support. 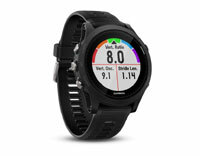 Premium light-weight GPS Running/Triathlon Watch with wrist-based heart rate sensor, barometric altimeter and compass, advanced performance monitoring and running metrics analysis, long battery life, smart notifications. 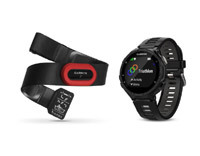 Advanced multisport GPS watch with wrist based heart rate monitor and advanced cycling, swimming and running dynamics when used with relevant straps, smart notifications, live tracking and customisation. Also available in Midnight Blue/Frost Blue colour combination - please call 01-293 6987. GPS running watch with wrist-based heart rate sensor, advanced running dynamics when used with optional running dynamics pod, smart notifications, long battery life, supports contactless payments (limited in Ireland). 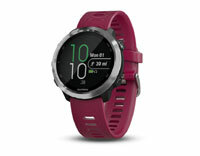 GPS running watch with music and wrist-based heart rate sensor, advanced running dynamics available with optional running dynamics pod, smart notifications, compatible with a Spotify Premium Account. GPS running watch with Elevate wrist-based heart rate technology. Tracks distance, pace, time, heart rate. Activity tracking counts daily steps, distance, calories and sleep. Customisable. Easy to use GPS Running Watch with wrist-based heart rate sensor, smart notifications (text, email), live tracking, activity tracking (steps/calories/sleep), suitable for running, indoor running, cycling and cardio.